Blocking sites from showing up in the Google search results no longer works. First reports came a week or so ago via Google Web Search Help where Googler, Kousha, said that "this was a known issue a while back." Well, it still seems to be an issue. I tried to replicate it and I was able to two different ways. (1) First, when you click on a search result and then click back, Google is suppose to show you an option to block the result from showing up in the future. That did not come up for me this morning. 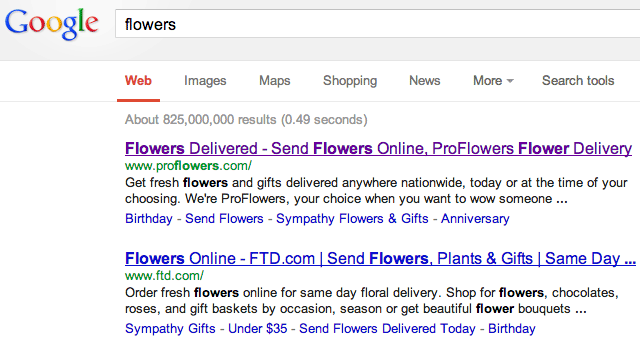 (2) Second, when the first option did not work, I went directly to blocked sites search setting, added www.proflowers.com to the list and waited a minute or two. Earlier this year, Google had a bug where you were unable to unblock blocked sites - that does work but you can no longer block sites in Google.